At some point in time, every family considers making a few changes to their property. However, very often, these plans fall to the wayside because the renovation seems to difficult. At Allpro Contracting, our Addison remodeling contractors are here to help you achieve all of your home improvement goals. Call us today and we can help you get your project started. Our highly skilled remodeling professionals have been proudly serving the Addison community since 1962. Throughout this time period, we have made it our priority to work our hardest to achieve complete and total customer satisfaction in everything that we do. When you hire us for your next project, our Addison contractors will bring this dedication to excellence to task for you. From whole home remodeling to designing and constructing concrete patios in Addison, IL our team is ready to work for you. If you have been planning an interior or exterior remodeling project for you Addison home, call Allpro Contracting today for help. Our highly skilled professionals are ready and eager to assist you in any way that we can. Our experts are adept at concrete paving, roofing, kitchen remodeling, siding installations, gutter replacements, and more. We would be excited to schedule your appointment today. The hardscaping around your residence is absolutely critical to how you and your family use and enjoy your home. 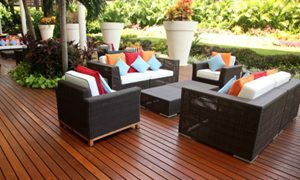 A beautifully designed patio is the perfect place from which you can enjoy your entire yard. A well maintained driveway enhances the curb appeal of your residence and the first impressions that guests form of your property. Walkways can be used to promote safe navigation to all the areas of your yard. At Allpro Contracting, our Addison exterior remodeling contractors specialize in brick pavers and concrete paving services. With our assistance, you can design exquisitely beautiful hardscaping features that will vastly improve your residence. You and your family are guaranteed to be pleased with the results of our efforts. One of the most important portions of your residence is your gutters. If you do not have well-designed gutters around your home, your property becomes susceptible to a great deal of damage. Water will cascade off the side of your roof, harming your windows, siding, doors, and landscaping. Water will then pool by your property and can seep into your foundation. At Allpro Contracting, our Addison exterior remodeling contractors can assist you in this regard. We are adept at installing, repairing, and replacing gutter systems for our customers. With our help, you and your family can rest assured knowing that gutters are protecting your home at all times. If you are looking for a professional Addison remodeling contractor for patios, driveways or other interior and exterior services, then please call 708-658-3500 or complete our online request form.